A major revision of a classic planning text. This book contains a complete model subdivision ordinance for city and county governments as well as more than 100 pages of legal commentary. The model regulations are generally compatible with all state statutes and work in urban, suburban, and rural settings. They show how communities can finance capital facilities, balance new development with existing surroundings, avoid exposure to the legal pitfalls of takings and substantive due process claims, and much more. Two new chapters cover public facilities impact fees and land readjustment. The chapter on impact fees includes a section on regulatory takings law that looks at how prominent U.S. Supreme Court cases have affected property rights, development, and regulation. Each section of the model regulations is followed by insightful commentary that supports, annotates, and documents the text. The authors explore the rationale for using various regulations, basing their arguments on existing statutory authority, case law, and federal constitutional requirements. The commentary identifies and explains changes from the original model regulations. 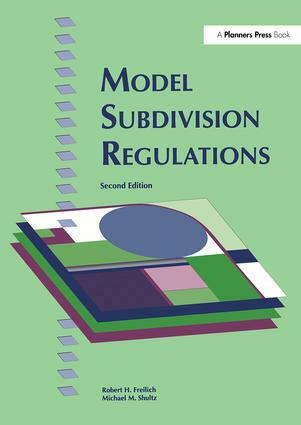 Whether you're drafting new regulations or considering amendments to existing ones, you'll find Model Subdivision Regulations to be an invaluable reference.